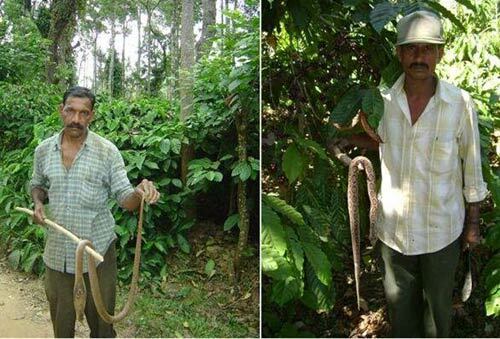 Readers are requested to refer to Snake Diversity and Conservation Inside Coffee Forests for a better understanding of the present article. The Biblical curse has a curious reference about snakes. Hence the animosity between the two – MAN and SNAKE is innate and time memorial. Shade grown ecofriendly Indian coffee has many unique distinctions. The rare assemblages of flora and fauna in the coffee forests make it one of the most important biodiversity hotspots of the world. Lurking in the forest one can find a bizarre collection of snakes. 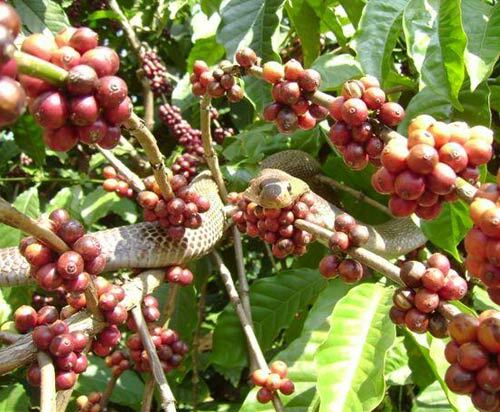 The presence of different snake species speaks volumes about the fertility status of the coffee forests. 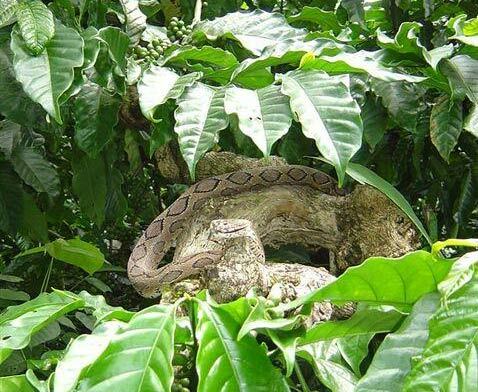 In fact for hundreds of years; snakes have acted as powerful symbols to the village folk in balancing the energy flows inside shade grown coffee forests. Coffee farmers living in and around the forest corridor are known for the conservation of forest wealth. In the early days of farming, farmers had great respect for the forest resources and worked in close cooperation with nature. 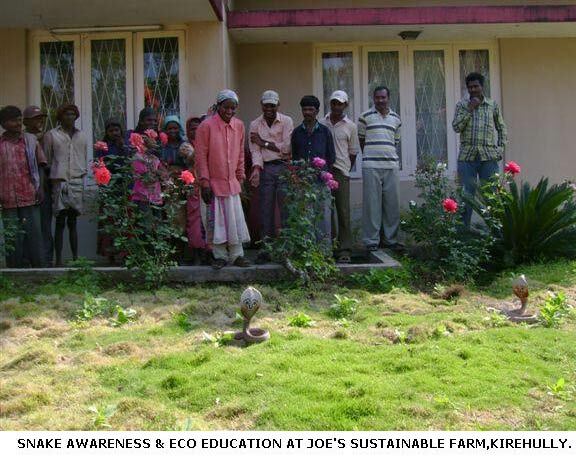 Farmers were aware of the beneficial role; snakes played in the coffee ecosystem, eating rodents and smaller prey. Even though, the concept of conservation is well supported by the coffee farmers, it is the modern day practices of using powerful; result oriented chemicals that have put undue pressure on the land. Toxic chemicals have found their way into food chains. 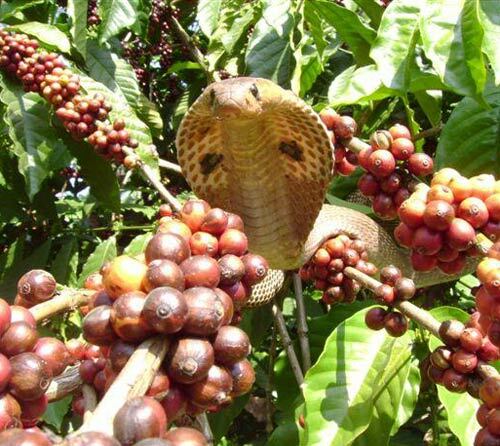 This paper throws light on the increasing pressure on the fast dwindling coffee forest resources, resulting in the destruction of snake habitats. 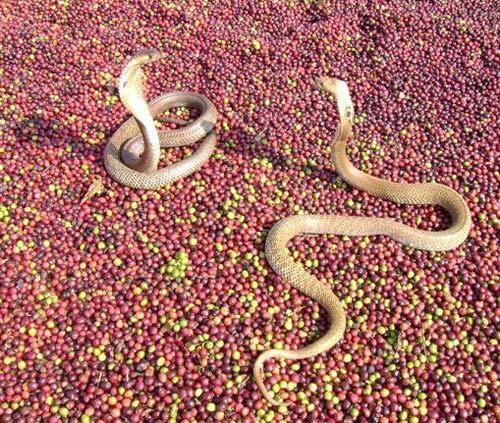 This is the single most important contributing factor resulting in the conflict between coffee farmers and reptiles. 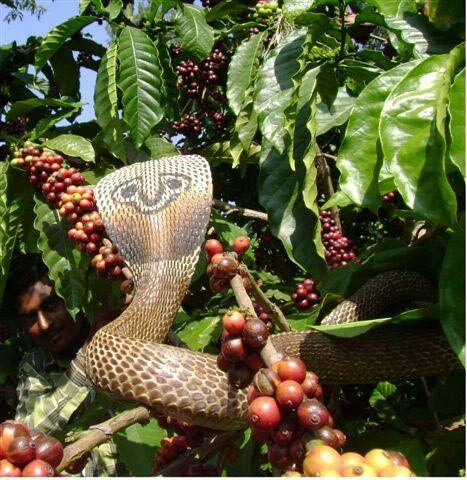 For some strange reasons, snakes have always been associated with fear in the minds of most coffee farmers. The inborn fear regarding their toxic venom plays a key role in killing most snakes, irrespective of whether they are poisonous or nonpoisonous. An interesting fact is that only 150 out of 2000 species of snakes are poisonous. 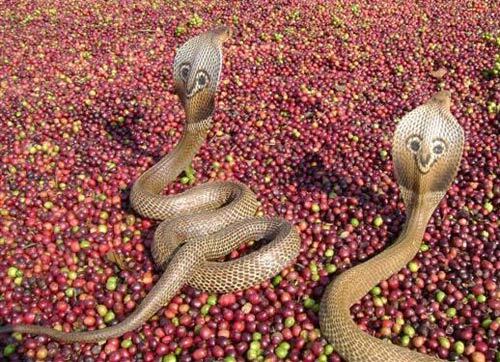 The coffee forests provide a perfect micro habitat for the proliferation of various snake species. 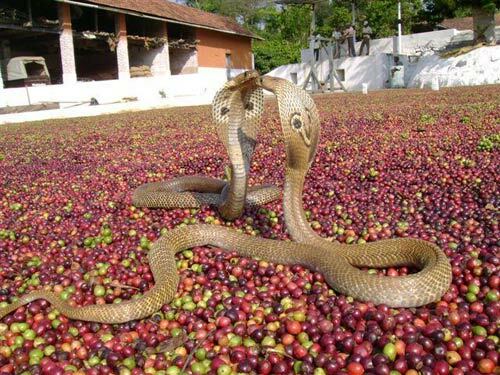 Three important species of venomous snakes, namely the spectacled cobra, Russell’s viper and common krait are commonly observed inside coffee forests and often come face to face with coffee farmers. All the three snake species occupy a variety of habitats, from densely wooded forests to the open wetlands bordering the coffee farms. 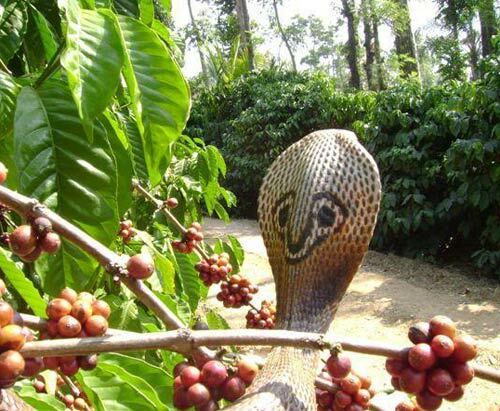 They are often found under the biomass or on coffee bushes. 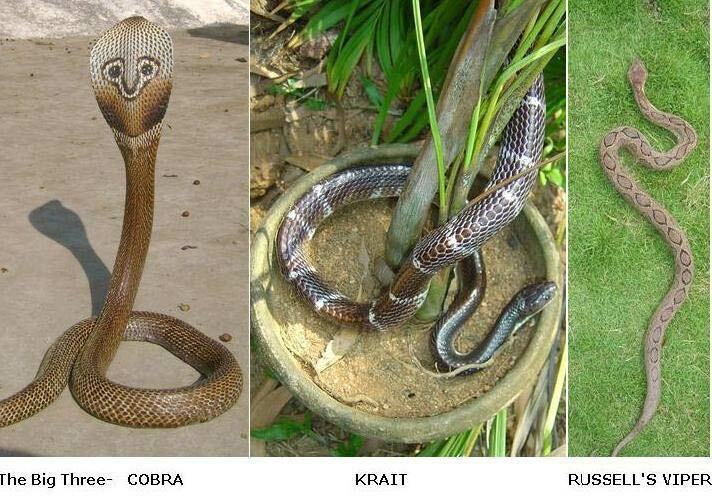 The fact of the matter is that these three species of snakes are known to use venom only in case of self defense. Human made habitats close to the place of dwelling like garden lawns, haystacks, godowns and firewood storage places attract lizards and rodents which form the stable diet of most of these snakes. Also, inside the coffee farms most of the mud roads in-between coffee blocks are kept clean resulting in the exposure of sunlight directly on the ground, inviting the cold blooded creatures to regulate their body temperature in the open. Expansion of coffee forests into lowlands and wet lands. Wetland ecosystems play an ecologically important role in maintaining the balance between predator and prey species. They serve as an ideal habitat for many species of frogs, fish, rodents and reptiles. The wetland ecology also provides as a key breeding site for various species of smaller insects which acts as a source of food for snakes. However, these ecologically sensitive wetlands, bordering the upland coffee forests have been severely reduced and fragmented into arecanut gardens and coffee plantations. Loss of virgin forests due to new clearings. Increasing biotic pressure, both from within the coffee mountain as well as from the fringes. Indiscriminate use of pesticides, weedicides and chemical fertilizers. 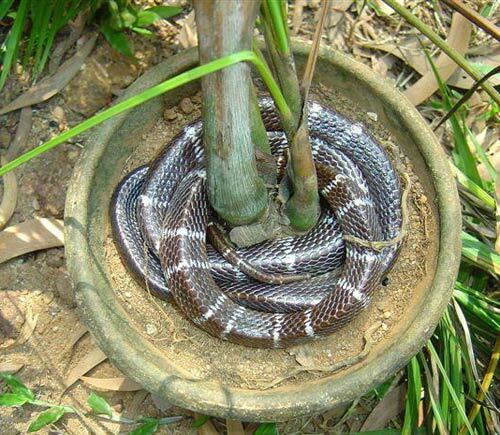 Snakes are particularly sensitive to chemicals and fertilizers. 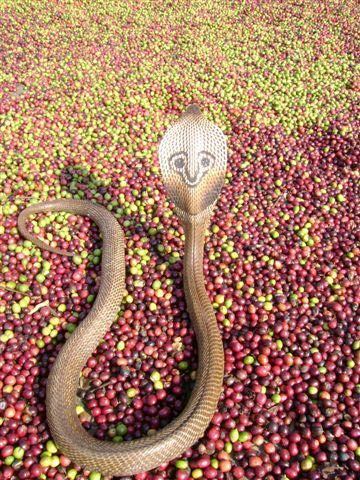 The Snake skin is very soft and can easily imbibe the chemicals present on the floor of the coffee forest. This can cause irreversible damage not only to the snake morphology but also to their resulting offsprings.The eggs too are vulnerable to pesticides and weedicide application. Nitrate Pollution of water sources. Setting up of animal traps. Adequate lighting in and around the living quarters. Fire wood stacks to be set up far away from the house. Workers need to be protected with footwear. Workers need to be provided with adequate lighting (torch lights) during night times. The most basic requirements are willingness and inclination to learn and differentiate the poisonous and the no venomous snakes. The minute the farmers or the workers, spot a snake; they should be in a position to distinguish between a triangular and a round headed snake and the patterns associated with the snake. 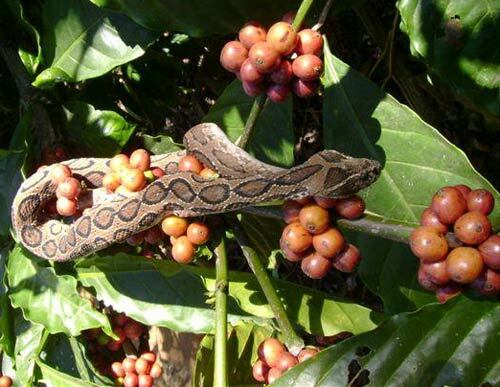 Both coffee farmers and workers need to be educated regarding the ecologically significant role played by snakes in maintaining the ecological integrity of the coffee forests. 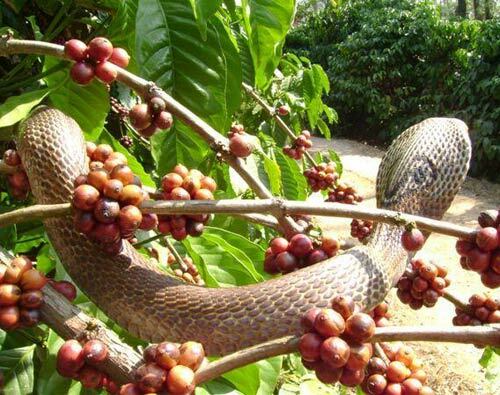 We have spent a great deal of time on public awareness and education aimed at helping University Professors, staff, students, local farmers and workers in understanding first hand, the significant value of snakes and their role in balancing the energy flows inside shade grown coffee. The translocation of poisonous snakes to safe habitats is a common practice for managing human snake conflict at Joe’s ecofriendly coffee farm. Most importantly, when poisonous snakes are sited on the farm, especially during the mating season, we bring our staff and workers to the site and enlighten them on the importance of snakes in maintaining a healthy eco system. The impact of this management has yielded tremendous response. Today, if any snake is sighted in the KIREHULLY VILLAGE, word is sent to us, so that the snake is either translocated to safer habitats, ( poisonous ) or else simply allowed to go its way, if it is nonpoisonous. 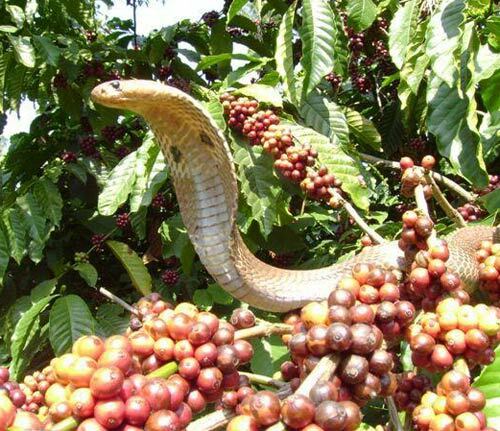 Many coffee farmers have given us a feed back saying that due to the conservation efforts; they are in a good position to identify the poisonous and nonpoisonous snakes. This is especially true when it comes to the common rat snake and cobra. 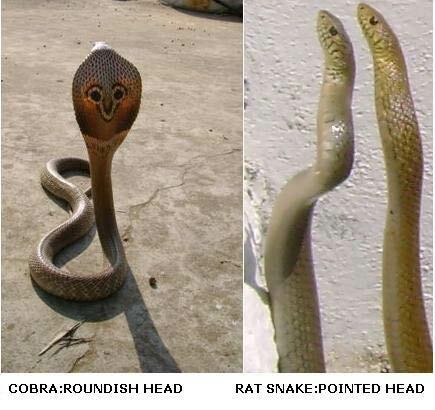 Both look alike and often the rat snake is mistaken as a cobra. 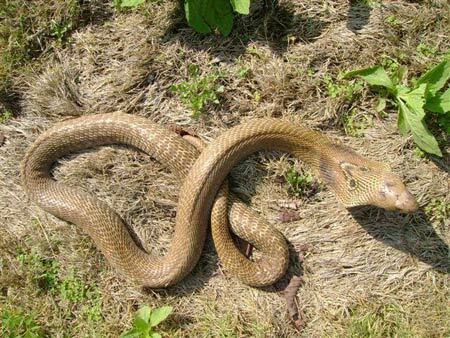 The rat snake is in fact longer and thinner with a pointed head and prominent eyes. 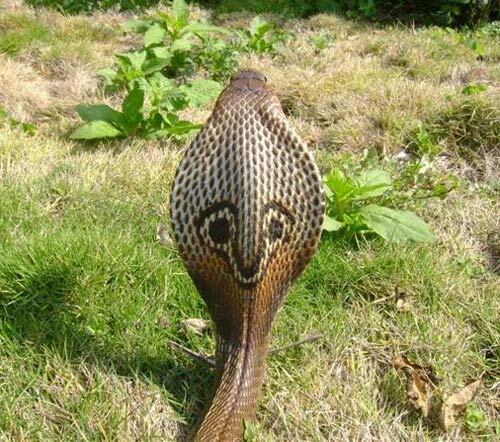 The cobra has a more roundish head. The more information people have about snakes, the less they perceive them as threat. 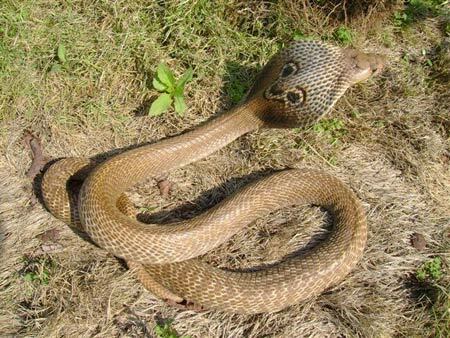 The Indian cobra is also referred to as the spectacled cobra. The rear of the head shows a connected pair of rings joined by a single line, giving the appearance of a pair of spectacles. Adult cobras can grow to a length of two meters. 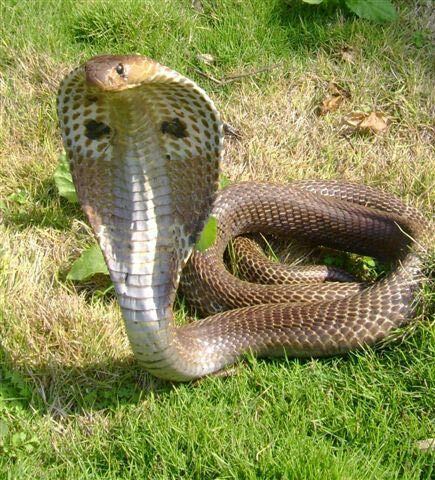 Indian cobras are oviparous and lay eggs between the months of April and July. The female lays 12-30 eggs and incubates them for almost two months till they hatch. Newly hatched young ones have active venom glands and tend to disperse one or two weeks after hatching. 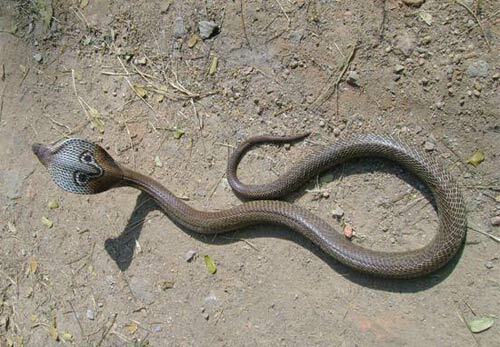 When cobras feel threatened they spread their hood as a defense. 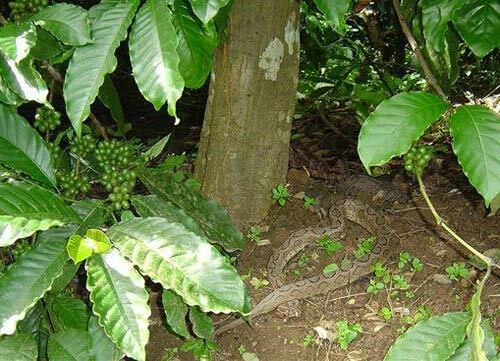 This snake in particular is considered as one of the most poisonous snakes inside coffee plantations. Its head is slightly wider than the neck; body is jet black above with distinct white cross lines, belly is white. VENOM: The venom is 15 times more toxic than that of a cobra and acts both as neurotoxin and haemotoxin, paralyzing the respiratory centre. Egg layers. Males are larger than Females. VIPER:These snakes are categorized as RUSSELL’S Viper & PIT vipers. Russell’s viper is commonly observed inside coffee forests. It is brown with deep elliptical patches that run in three rows. They are active both during the day and night. The diet consists of Lizards, scorpions, crabs and rodents. VENOM: The venom of Russell’s viper is considered as one of the most dangerous of all Indian snakes. The venom has a direct effect on the blood stream. 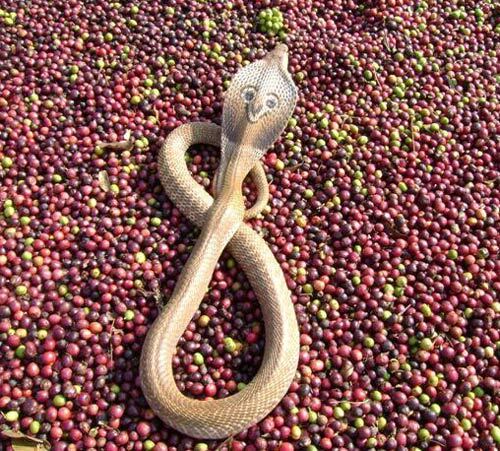 Two key components of the coffee ecosystem are essential for the survival of snakes inside coffee forests. The large number of diverse trees provides adequate shelter, shade and biomass for both prey and predator. Snakes together with the associated under bush allows for the deeper connection between the two. 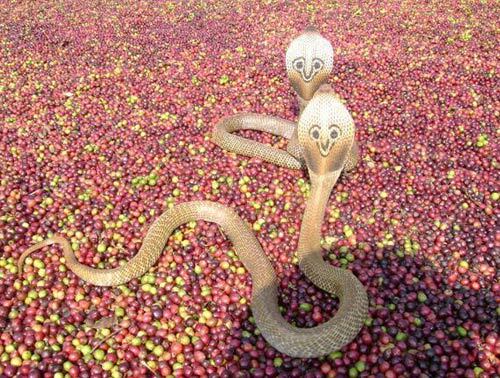 The coffee landscape and the forest environment are of supreme importance to both snakes and prey and the ability to survive in the environment where it lives will determine its success or failure as an individual species. The rise in logging inside the coffee forests has reduced the habitat for both prey and predator. The rate of deforestation is accelerating and there is a growing threat of further degradation and fragmentation of the coffee habitat. The resulting loss of habitat has badly affected the flora and fauna of the region. 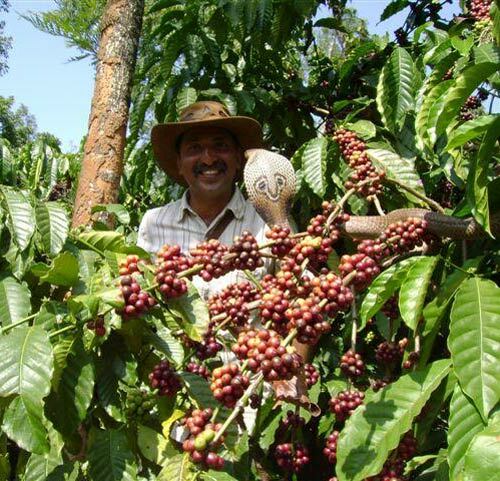 We have worked on coffee ecology for more than two decades and our observations point out to two very interesting facts. Firstly, snake species are decreasing at an alarming rate and secondly, the snake species surviving are the ones that belong to the nonpoisonous species. Due to shrinking habitats, venomous snake populations are disappearing right in front of our eyes. Some rare species are in the fear of dying out. The coffee forests are unique and we need an urgent action plan to better protect the flora and fauna of the region. If nothing is done soon, some of the rare species could disappear from the face of the earth. Daniel. J. C. 2000. The book of Indian Reptiles and Amphibians. BNHS/Oxford University Press, Bombay.